Knocking NatHERS has become a favourite pastime of some sections of the building and design industries. Some of this is fair, but there is a lot said which deserves the Myth Busters treatment. Not simply because it is wrong. 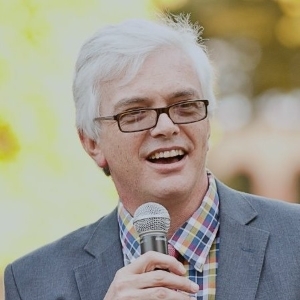 Ill-founded criticism of NatHERS is corrosive. It destroys confidence in the scheme. Assessors won’t feel obliged to follow rating rules, and builders won’t understand the importance of building the house to the rating specifications if they think the rating software just doesn’t work. More importantly, ill-founded criticism draws attention away from those things that could work better. NatHERS isn’t perfect and should be improved. However, it will only get better when industry feedback focusses on those things which really need to be improved. Second generation NatHERS software was developed to specifically address the concerns of hot climate design experts about NatHERS. However, it doesn’t seem to have helped. You only have to look through the submissions to the Queensland Government’s Parliamentary Inquiry into Energy Efficiency to see that industry has many concerns about NatHERS in northern climates. According to industry, NatHERS tools simulate a sealed box and never open windows to improve comfort and do not take into account the advantages of lightweight construction in these climates, i.e. the ability to cool down rapidly to make the dwelling more comfortable. The report addresses these two issues directly. The ANSNAC report investigated how the Chenath engine – CSIRO’s building thermal simulation tool used in all NatHERS software – works in hot climates. A special version of Chenath was developed for this project. The hourly temperature file had several additional outputs added. It recorded every hour the windows were opened or ceiling fans were switched on, and it showed the calculated additional comfort caused by air movement. 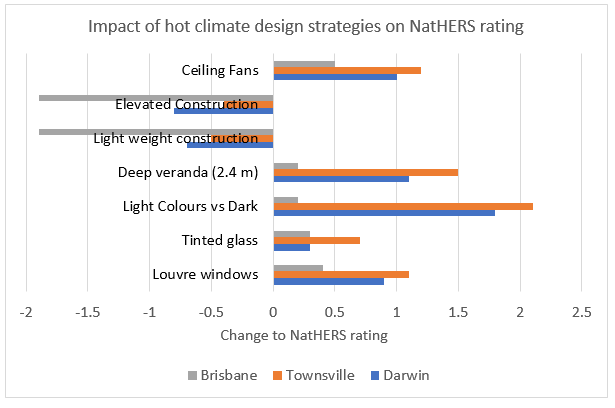 The project compared the performance of four houses designed using traditional hot climate techniques with two volume market houses in six northern climates from Darwin to Brisbane. It also evaluated how typical hot climate design features affect energy ratings. NatHERS tools don’t simulate a sealed box. Each building was optimised to meet minimum NCC requirements. Interestingly, the Hot Climate design houses complied with 50% higher glazing areas than the volume market houses. Chenath checks whether conditions inside the house will feel comfortable if windows are opened whenever the internal temperature would go above the thermostat temperature if windows were left closed. If comfort can be maintained by opening windows (or turning on ceiling fans) it will always do this in preference to turning on air conditioning. 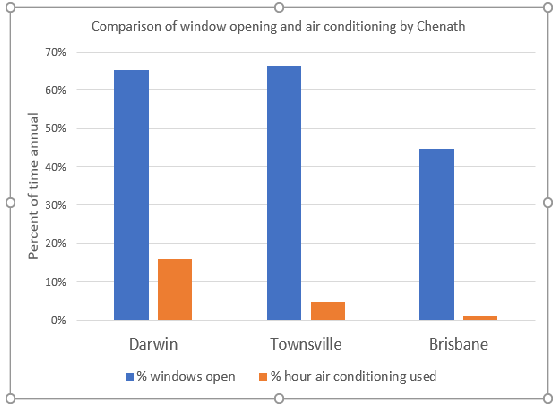 As you can see in the graph above it opens the windows four times more often than it uses air conditioning in Darwin, and forty times more often in Brisbane. NatHERS tools don’t simulate a sealed box. Most hot climate design strategies significantly improved the rating of the house except for elevated and lightweight construction. Benefits were lower in Brisbane because Brisbane has some heating requirements. Although heating loads are smaller than cooling in Brisbane, a number of the hot climate strategies made heating performance worse. Overall star rating improvements are therefore lower, but the improvement to cooling performance was similar to other climates. 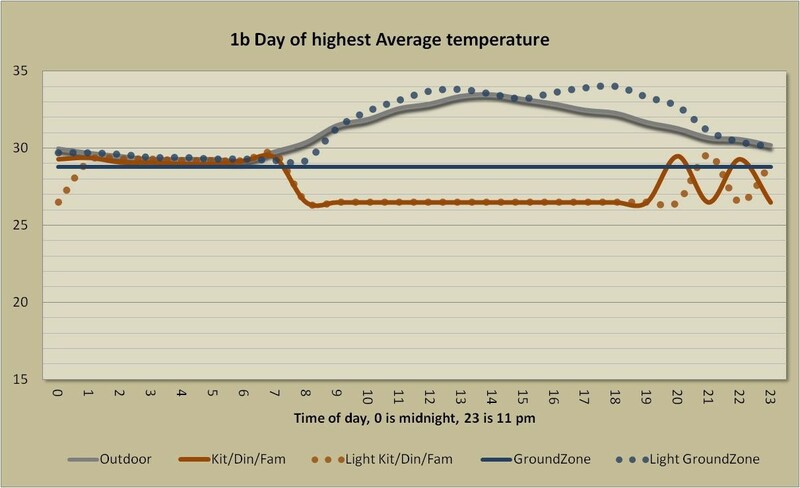 To better understand why the use of a timber floor and lightweight walls (also used in the elevated construction case) had such a negative impact on the rating the hourly temperatures inside the house, in the subfloor of the timber floored house and the ground under the slab were examined. The results showed that the ground temperature under the slab is lower than the temperature of the subfloor. As a result, heat gains through the floor are less when a slab floor is used. The benefit of the slab has less to do with thermal mass and everything to do with temperature differences. The lower temperature differences across the floor simply mean that the daytime cooling loads in the house with a slab floor in a hot climate are less than in a house with a timber floor. So NatHERS is perfect for hot climates? Some myths have been busted or at least explained, but that doesn’t mean that NatHERS is perfect in hot climates. The report also found that the benefits of traditional hot climate design in bedrooms were not being adequately rewarded because the cooling thermostat in bedrooms are too high. Moreover, it found that lightweight construction does have an advantage in bedroom performance. 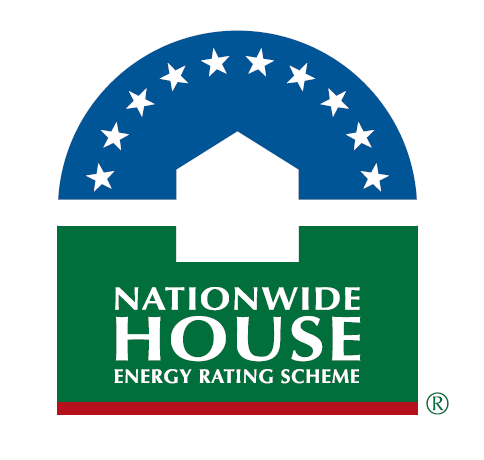 Ironically, the cooling thermostats in NatHERS second generation tools were increased specifically in response to requests from Hot Climate house design experts because a house designed to achieve free running comfort is not designed to achieve temperatures as low as an airconditioned house. Hindsight is a beautiful thing. Yes, and no. Yes, because you can simply change the settings in NatHERS tools to lower the thermostat in bedrooms. No because when you change thermostats, the energy loads change. This means that the current star bands don’t apply. Moreover, the ABCB will want to see the implications of any change to the software on the cost of compliance i.e. a new Regulatory Impact Statement. So, it isn’t just a matter of changing thermostats and re-issuing the software. It would take significant resources to do all this work and government would need to allocate these resources. The poor rating of some hot climate designs is not because NatHERS simulates a sealed box. We now know that second generation NatHERS has never simulated a sealed box. If anything, it probably opens windows too much, given acoustic privacy and security concerns, and the fact that occupants are not always home to open windows. Furthermore, apart from light weight construction, traditional well-ventilated design features receive significant benefit in NatHERS and these designs have much greater design flexibility: they achieve compliance with much higher window areas. But NatHERS outcomes for tropical design are not perfect. The solution to achieving better outcomes for hot climate design in northern climates starts with allocating sufficient resources to NatHERS. It needs the resources to be able to research criticisms and develop solutions. However, when significant portions of industry are loudly complaining that the software just doesn’t work it is difficult to get allocation of resources high on government priorities. To be honest, I did not anticipate the results I found in this project. I thought the sealed box criticism would probably hold up. What I have learned through this project is that we all need to have a more nuanced and considered approach to our frustrations with NatHERS. It works pretty well and deserves to have more resources allocated to it to make it even better.